The Alliance for Transportation Innovation in February 2016 offered Texans trips in a driverless shuttle that maneuvered along a pre-programmed route in parking lots near Globe Life Park in Arlington. Using or testing driverless cars isn’t explicitly illegal in Texas. State law doesn’t specifically address such technology. Some automakers and early developers of autonomous vehicles prefer the ambiguity and fear explicit regulations could stymie testing the technology in Texas. Others would prefer guidelines before they start using Texas highways as proving grounds. Geren hopes to come up with legislation that both sides will be happy with. He admitted the bill he authored this week may not do that just yet. But its current version was simply meant to meet Friday’s deadline for filing bills for the legislative session that ends in May. Among other things, the current version of Geren's bill would require the owner or operator of an autonomous vehicle obtain a surety bond or insurance worth $10 million. The vehicles would have to be able to operate in compliance with existing traffic laws. Google opposed that bill two years ago but declined to publicly explain why at the time. Months later, the company began using a Lexus RX 450h SUV outfitted with self-driving equipment to test driverless cars in Austin. The tech giant’s autonomous vehicle efforts have since spun off into their own company called Waymo, which opposes Geren's bill. "Waymo continues to work with legislators who have an interest in the safe development of fully self-driving cars," a company spokeswoman said late Thursday. "We believe this legislation is unnecessary and may inadvertently delay access to technology that will save lives and make transportation safer and easier." Niti Ross of Arlington has common reservations about driverless cars becoming the norm on American roadways. She said that for her to feel comfortable giving up control, the vehicle would have to tell the speeds of other vehicles, know when a pedestrian is crossing the street and detect when another car is getting too close. Ross and her friend Kelly Sutcliffe took a trip to the Arlington Convention Center last month when he Alliance for Transportation Innovation in February 2016 offered up trips in an autonomous shuttle. The red, box-shaped vehicle moved along a pre-programmed route through parking lots near Globe Life Park. “It's a neat concept and it was fun to ride it,” Sutcliffe said. The women could imagine such a vehicle transporting sports fans from far-flung parking lots to the front door of arenas. Industry experts say such uses are how Americans may first get used to the technology. Similar shuttles are also envisioned as being used in mixed-use developments or on expansive corporate campuses. 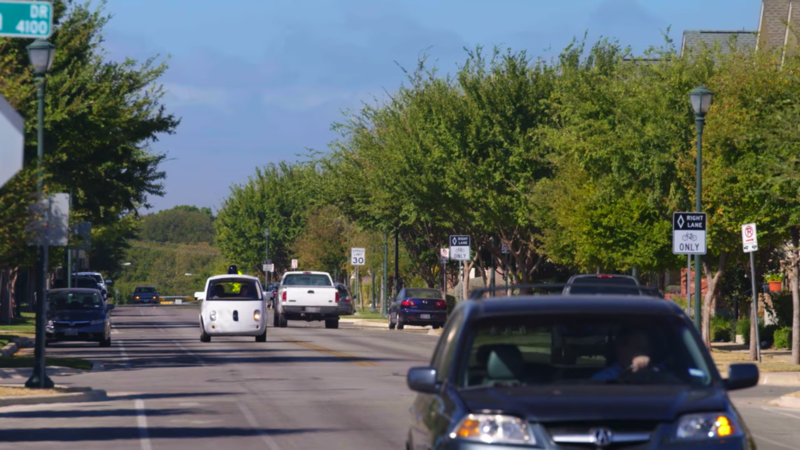 The U.S. Department of Transportation earlier this year designated several sites in five Texas metropolitan areas as proving grounds for autonomous vehicles. All of the tests will be done in controlled environments, not in everyday traffic. “The Texas AV Proving Ground Partnership’s recent federal designation and our member companies’ work in this area in Texas will further assist the industry in expediting these technologies to market and – perhaps more importantly – in building needed consumer acceptance,” said Gage, the industry group spokesman. Among the test sites are Austin-Bergstrom International Airport, Texas Medical Center, Interstate 30 in North Texas, the Fredericksburg Road and Medical Drive corridor in San Antonio and the Tornillo/Guadalupe Port of Entry in El Paso. The current version of Geren’s bill explicitly allows driverless cars on highways. It doesn’t yet have any restrictions on using the vehicles in traffic. Lightsey, the GM executive, lauded the state representative for filing something that could help develop more data about the performance of autonomous vehicles in traffic. Like many, he said driverless cars are safer than human motorists. And in Texas, at least one person has died on a roadway every day for more than 16 years. “Self-driving vehicles have the potential to save thousands of lives on Texas roadways each year,” Lightsey said late Thursday. Geren said he hopes to get all factions of the automobile industry on the same page and a bill to the governor before the session ends in May. “My end goal is to make Texas ready for driverless cars,” he said. Last October, Austin made history under a shroud of secrecy, it seems. Today, Google’s parent company Alphabet announced its intention to bring driverless cars to the open market in a new endeavor called Waymo – a project that, according to the company, had its first successful, truly driverless test on Austin’s roads.